This is a review of my first experience of the revised Club Europe food offering from Nice which is categorised as Band 2. You can find the full list of bands and meal details in this article. Check-in had no real queue since we were early and the check-in agent was friendly enough. It was disappointing to see that there was a fast track lane but BA business class passengers do not have access to it. I find this very surprising on a premium route such as Nice. Fortunately, the regular security queue was fairly short so it wasn’t an issue on this occasion. 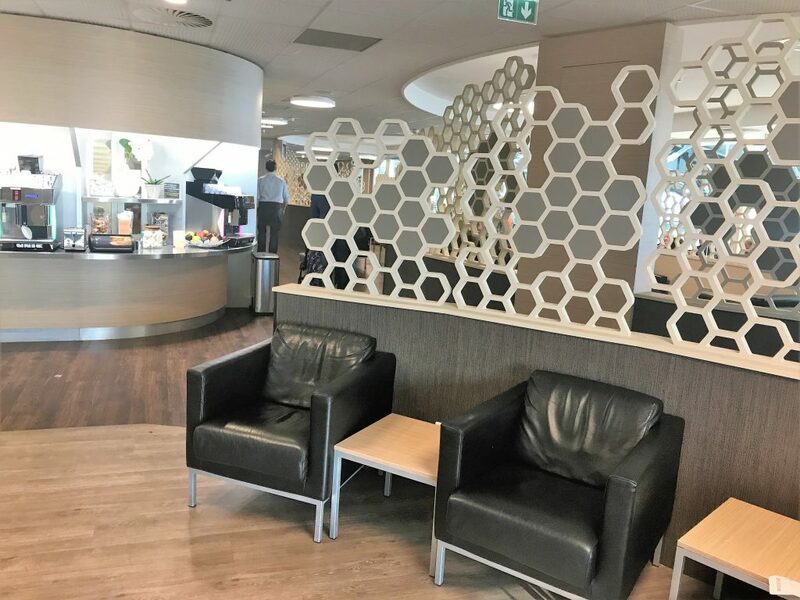 I had been warned not to expect too much from the lounge at Nice but initially, I thought the space looked modern and reasonably sophisticated. 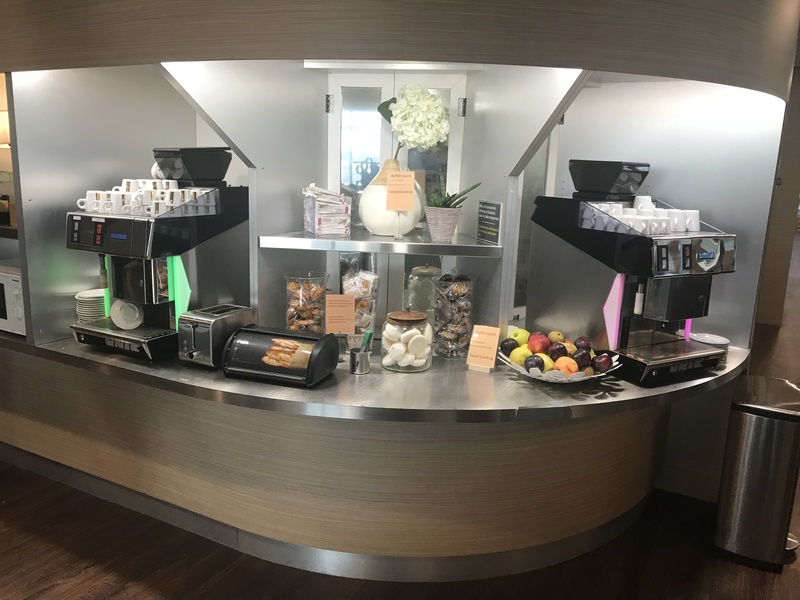 BA use the third party lounge Canopy lounge in Terminal 1’s non-Schengen area which is also available to Priority Pass members. We had arrived pretty early so there was plenty of room to sit at least. The reasons why people do not recommend the lounge became clear very quickly. This was a very typical third party lounge with minimal food offerings – not hot food, just a few snacks. It was a strange choice as well with yoghurts and cheese being the main offerings. There was also cakes, biscuits, fruit and bread. Drinks weren’t much better with fairly basic white, red and rose wine and no fizz. There was a random mixture of spirits too. This was fairly pointless as it was a bus gate. There were no signs for groups but they did call each group by number. As group 1 it meant you were hanging around for ages on the bus waiting for people but since I was with my mother it did at least mean she got a seat. This was an A320 ( I think maybe ex BMI?) with the row 1 larger tables which I like despite the old fashioned look of the cabin. In row 1, the CE tables are a normally a bit wobbly, slopey and definitely small if you want to work. The fold-down tables on the wall in row 1 are massive but only available for the window seat and the unoccupied middle seat. 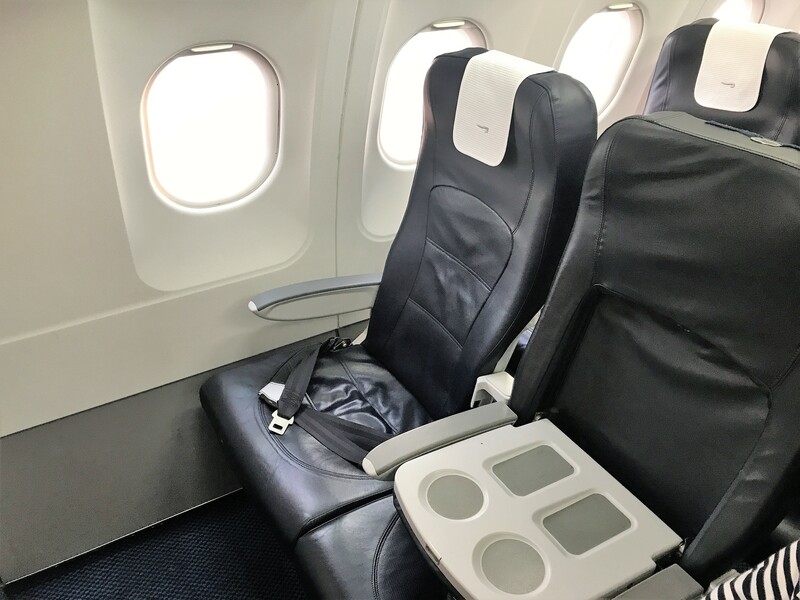 In Club Europe, the only seats that have extra legroom are in row 1 usually with the rest only having the same as Euro Traveller (except on the A320neo and reconfigured A320 where there have reduced economy leg room in some rows). We were in seats 1D and F. I had swapped seats with my mother but the CSM rightly assumed that I was the Gold card holder when he came over to give me a gold greeting. He managed to do this in a fairly natural way and chatted about our visit to Nice. Being Band 2 there were no menus on this flight and the meal was cold. This route before had the panini or the tiny salad so I could only hope that this would be better. There was a choice of a chicken caesar salad or a vegetarian couscous salad. We both chose the chicken. Hot towels were also handed out. 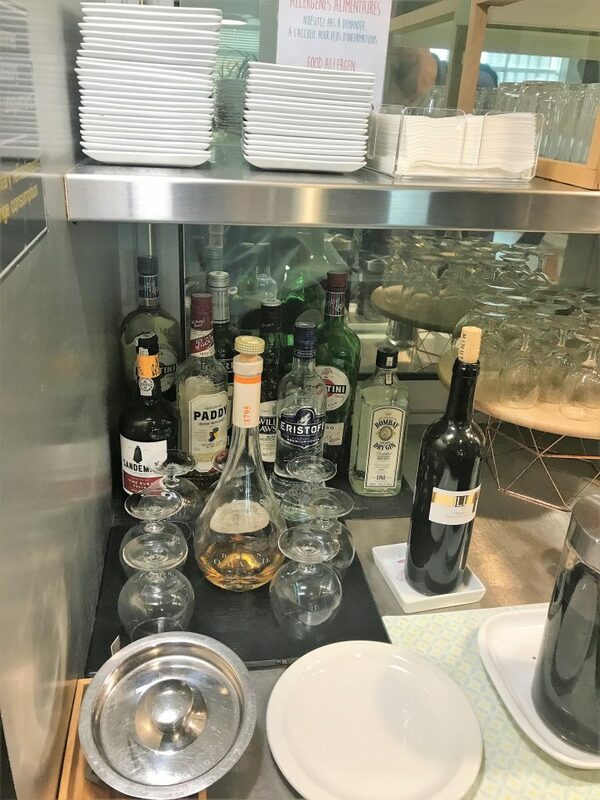 The service now consists of a drink with your meal rather than separately on the majority of routes except the longest routes. Despite a reasonably big cabin the poor CSM was on his own and I feel sorry for the rows behind as the service seemed to take a long time. Unfortunately, as he explained, this was his first time with the new service and he wasn’t really up to speed. Unluckily for him, I was so I could see he wasn’t actually doing it as he should have. Ice was still offered with drinks (not that I care as I always just ask for exactly how I want it to save time) and he forgot the bread completely which was a shame as I was looking forward to trying the new bread. Overall the meal was tasty and with bread would be much more substantial than the previous measly salads (3 prawns anyone??). The starter was smoked salmon on a grain mustard potato salad which had a nice little kick to it. The chicken wasn’t too firm and the Caesar dressing was tasty but not garlicky. My only real complaint is why would you have potato salad in two courses – it suggests a lack of joined up thinking in the menu planning. The dessert was interesting as it looked like a cheesecake but actually was cooked apple and blackberry on a biscuit base, a bit like summer pudding. I found it not too heavy or sweet which makes a nice change for an airline dessert. 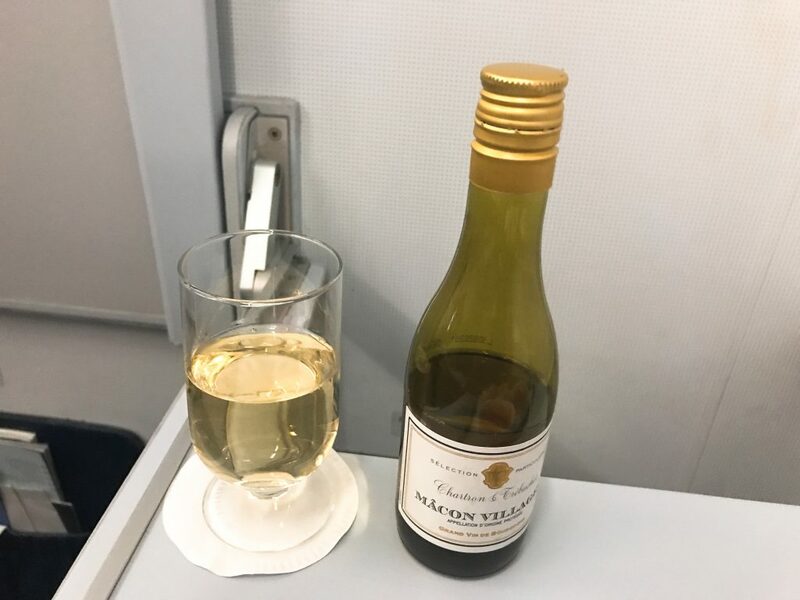 To drink I decided to try one of the new onboard wines. Previously the wine in Club Europe had generally been very poor but I am pleased to say this was a substantial step up on previous offerings. Whilst it may not have been what you would call a fine wine, the Macon Villages was enjoyable. I finished with a cup of tea in the new mugs which I thought were very elegant and held a decent amount too. 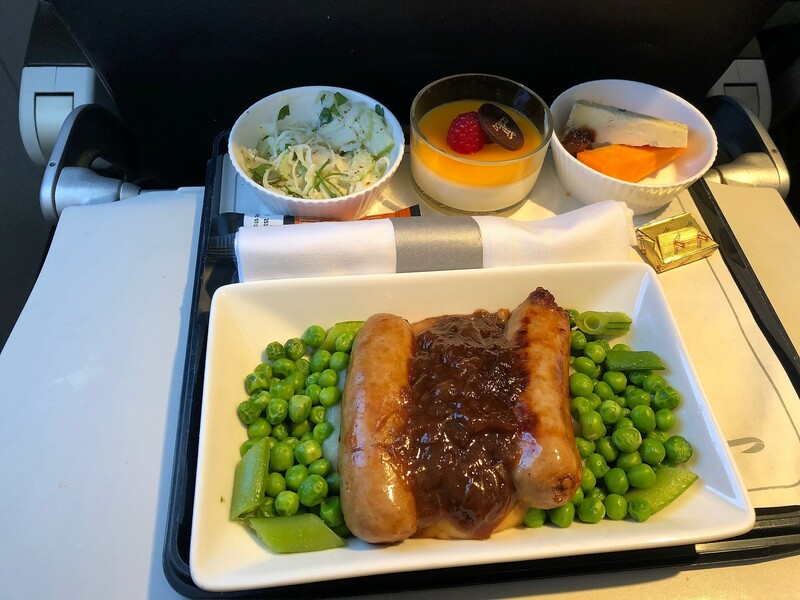 Although Nice itself was disappointing as an airport given the amount of premium traffic, the new food was definitely was an improvement for me on the previous medium band meals. The food was more substantial and tasty. The wine was also better despite being in small bottles and it felt that BA had actually spent some money in this area. It was a shame that the crew weren’t up to speed yet but I am sure this will quickly resolve. At least the CSM serving me was very friendly. 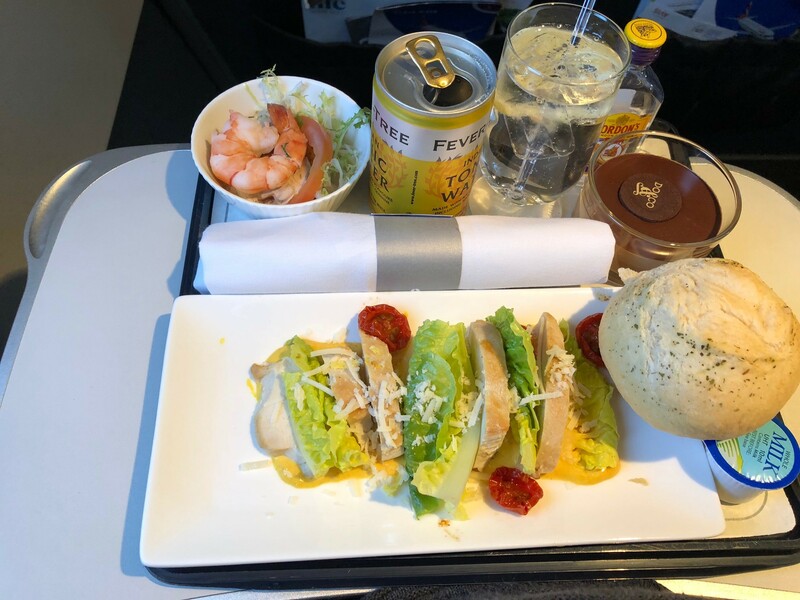 Meal & drinks served straight after take-off. Enormous amount of beef! CSM said afternoon tea was embarrassing but otherwise the crew seem pleased with the change. 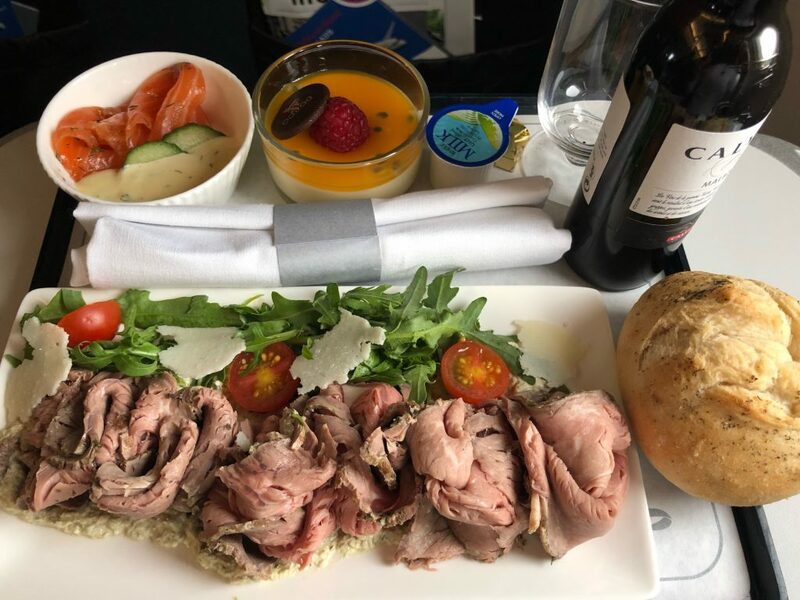 Like you, we had the Privatair 737 JER to LHR – I’m glad I wasn’t the only one who had problems with the tables – mine was at a permanent 45 degree angle which made for an interesting meal! 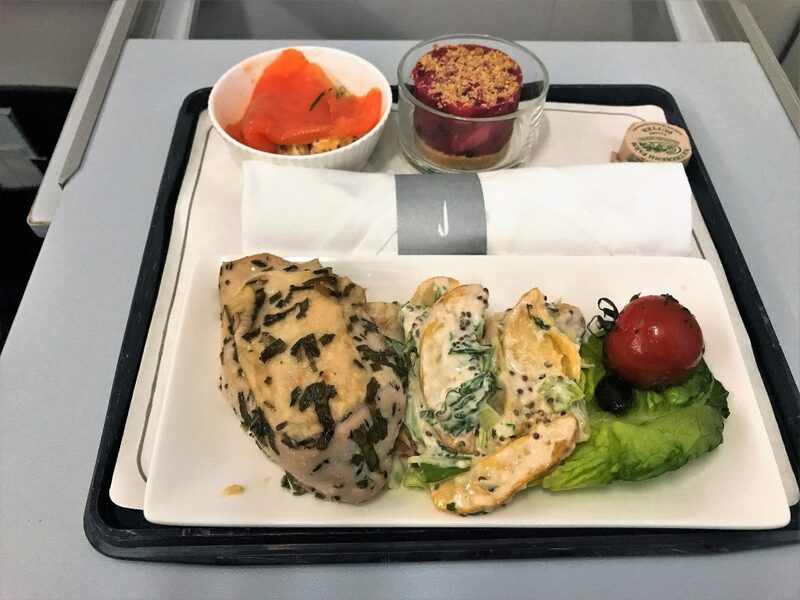 No choice of meal – we were offered the chicken salad with some potato salad and a small salmon starter and a summer pudding dessert. Probably the tastiest salad we had on all the flights but the flight is far too short to do it any justice. Lunch was the rather gross sausage and mash for me. 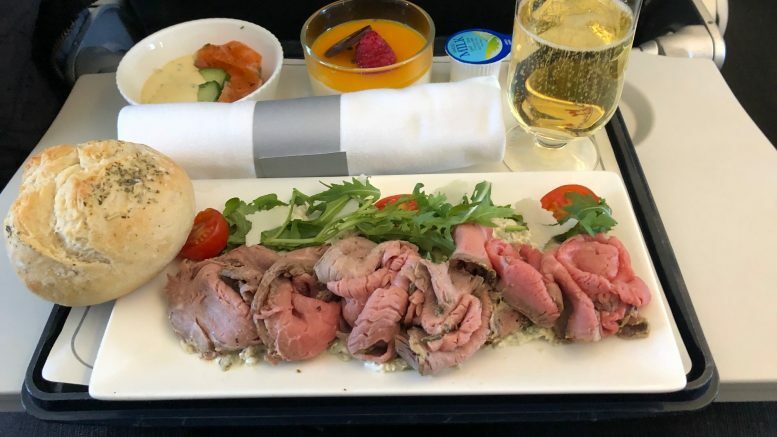 Really disappointing meal considering the length of the flight. Poor husband was after the nicer sounding beef salad but they had run out by row 2 and he ended up with equally inedible courgette gnocchi. I must say the meals reminded me really strongly of bad transatlantic economy experiences! The dessert (a passion fruit cheesecake/parfait thing) was quite nice and the crew kept the drinks flowing. This was the only service we were offered menus on which were handed out on tarmac post hot towels. 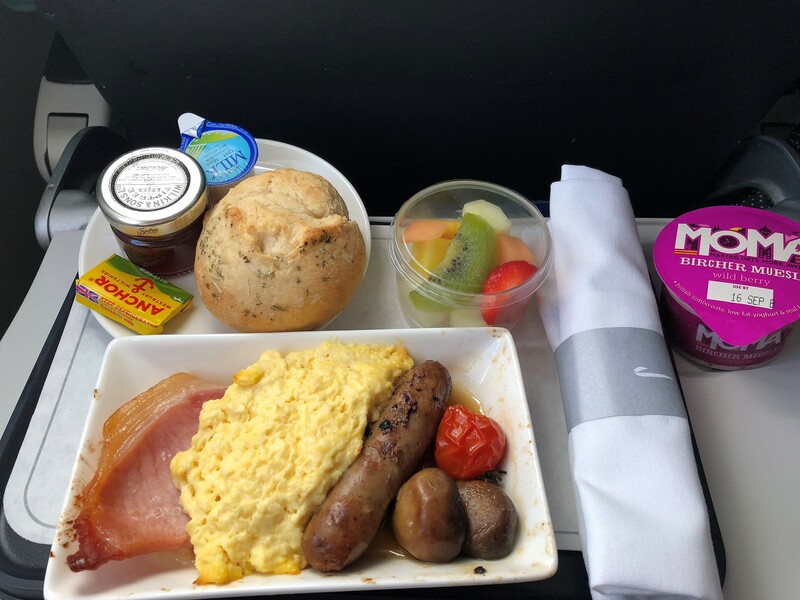 We both went for the full English breakfast but had to ask for fruit and yoghurt and had the snippiest crew – everything was too much trouble particularly for the CSM who sounded like she would rather be anywhere else than this flight. Scrambled egg was surprisingly tasty – I usually expect rubber but this was really light and creamy. Lovely crew on this flight – very eager to please. We could hear them discussing the new dining service and going through the new offerings in the galley! 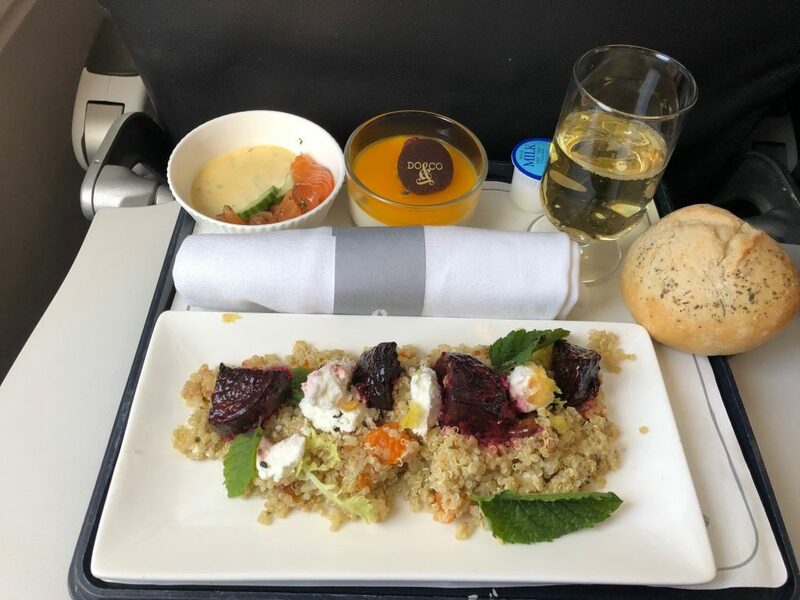 It was a much quieter flight in CE and the choices for lunch were beef carpaccio or feta, beetroot and quinoa salad. The beef had run out by the time it reached us in row three (only 4 ahead of us) for which the CSM was really apologetic and gave the impression there were ongoing issues with loading the correct number of the new meals. Beef was nice but the feta was pretty tasteless. 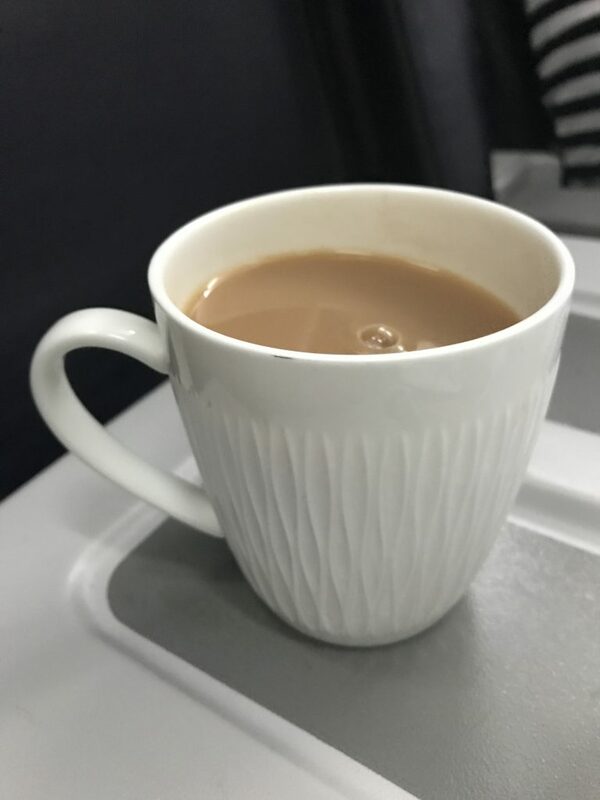 Busy flight – we could hear the crew complaining again that they hadn’t been given enough meals to cover various op-ups. Choices for lunch were Coronation Chicken salad or goats cheese cherry tomato and lentil salad with a King prawn salad starter. 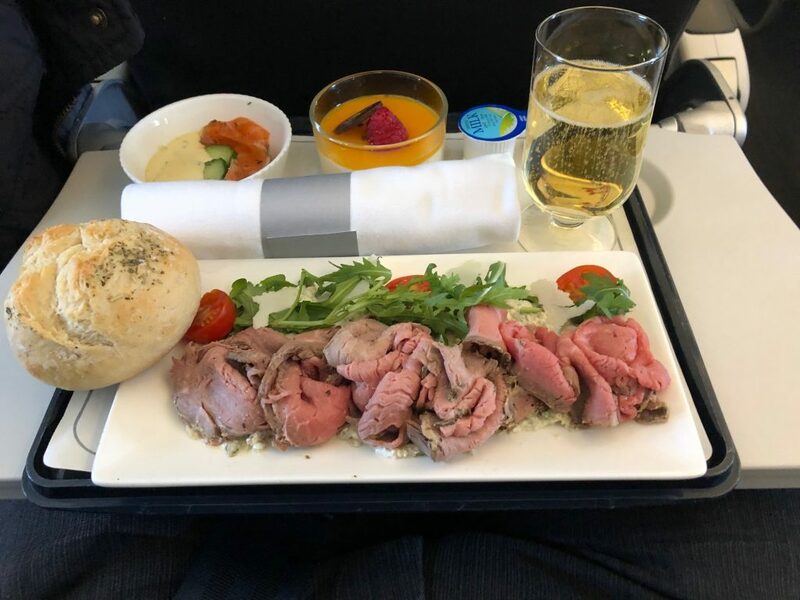 Better than outbound food but could hear them offering the outbound beef salad by the time they got to rear of the cabin. So that’s the end of our BA run for September! Husband and I are both silver which we are happy enough with given we live in Guernsey and have no BA connection. We tend to do one Europe run a year like this and then maintain silver with various long-haul runs over the pond. I guess long-haul service spoils you for these short runs – I wouldn’t pay for them if I didn’t want the tier points!! Have you tried the new Club Europe food – is it better or worse than before? Let us know in the comments below or on social media. 4 Comments on "Club Europe review Nice to London with new food & your photos"
I’ve used the Nice lounge a few times and champagne was available on demand every time I was there. Has this changed or you it was not abailable at the selfe serve bar? Thanks George. No idea if it was available as I didn’t see anyone drinking it. Obviously a well kept secret! Good to hear. Hoping I get it on one of my next flights….